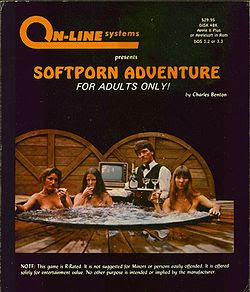 Softporn Adventure was the sixth adventure game by Sierra (then known as On-Line Systems). It was released in 1981, and is the only game without graphics that Sierra ever released. It was created by Chuck Benton, and was ported to MS-DOS by Gary Thompson. The game would later be adapted with graphics by Al Lowe as Leisure Suit Larry in the Land of the Lounge Lizards. The hot tub in the photo on the cover was owned by the founders of Sierra, Ken and Roberta Williams. The disc shape in the background was the top of the hot tub cloned so that it appeared twice. The three women on the cover are (from left to right) a shipping clerk at On-Line Systems, the wife of Bob Davis (the creator of Ulysses and the Golden Fleece), and Roberta Williams herself. The waiter was an actual waiter from a local restaurant.